The Nigerian Army has spoken for the first on the claim by one Sergeant David Bako, who alleged that there was a top level conspiracy that stage-managed the abduction of Dapchi schoolgirls on the 19th February. Bako had claimed in an online publication that the Dapchi school girls’ abduction was planned in the villa and executed with N80 million. Reacting, however, Texas Chukwu, the Director of Army Public Relations, in a statement, said after cross-checking its record, the army could not find any “one call Sgt. 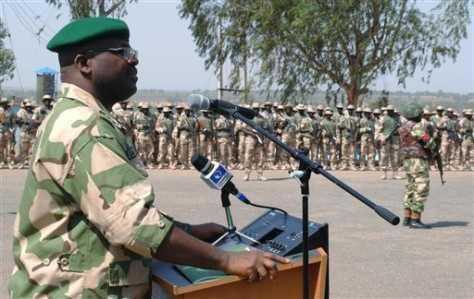 David Bako, who neither serves in the army, deserted or dismissed”. His statement reads in full. “The attention of the Nigerian Army has been drawn to a news report making round on Facebook and other social media to smear and drag the Nigerian Army into politics of calumny by mischief makers, that one deserted Sergeant David Bako leaks how Dapchi Girls abduction was planned in the villa and executed with N80 million. The information was said to be provided by Sergeant David Bako who claimed to be deserted soldier and one of the abductee of the Dapchi School Girls. “The Nigerian Army therefore put the record straight that it has crosscheck it records and cannot find any one call Sergeant David Bako who neither serves in the Army, deserted or dismissed. The Nigerian Army therefore disassociate itself with such fictitious report and request the public to disregard the confession made by the so call Sergeant David Bako who has not been in the Army at all. “It is imperative to know that these baseless and inane allegations are not new in the cyber space, knowing the fact that we are in the age of information warfare. Open Source Intelligence reveals that the website Dailyglobewatch.eu with country code top-level domain (ccTLD) .eu used in publishing stories is obviously fake and therefore not correct. Based on our findings the website was registered on the 14 of April 2017 and the last updated was on the same date and will expire on the 14th April 2018, we are very familiar with reports of this nature and will advice the general public to disregard such claim and desist from sharing such information on the New Media as this is against the Nigerian Cybercrime Act 2015. Meanwhile, Minister of Information and Culture, Alhaji Lai Mohammed, while also reacting to the report, described it as unfounded and social media lies. Ehennnnnnnn,d truth don dey come out. These Dapchi girls adoption is all plan work jare. We are’nt stupid a beg! There must be an atom of truth in every lies. nawa oooo i tire. from one drama to another.